Digital data have become especially valuable as forms of knowledge, especially when they are aggregated into big data sets, and are seen as having huge potential to offer new insights into a range of human behaviours, and to disrupt various industries: from health care to education. One key change in the age of ‘knowing capitalism’ is that there has been a shift from commodifying workers’ physical labour to profiting from information collected on people’s preferences – which online users willingly give when they create and upload digital content online, download and use geolocation apps, shop online, and like various content. In this digital age, prosumption is the new norm – people simultaneously consuming and generating online content and In commercial circles, the user of online technologies is ‘the product’, because the information they give off when online is so valuable. This is why so many applications, such as Facebook, are free to use – because they are really just platforms to harvest valuable data (why charge? )… and the Four big tech companies excercise huge power by virtue of the sheer amount of big data they have already, and continue to collect on their users. In the digital data economy flows of information are generated and engage in non-linear movement, and according to THrift (2014) new hybrid beings emerge with the mixture of data, objects and bodies….and bodies and identities are fragmented and reassembled through a process of reconfiguration. Furthermore, digital data and the algorithmic analytics used to interpret them are beginning to have determining effects on people’s lives, influencing their life chances and opportunities. There is a mobile dimension to how we interact with data too. Data can become stuck, for example when a company hoards it, or when people do not know how to use it! Data materialisations constitute an important dimension of knowing capitalism – data is lively, in flux, but it needs to be frozen to be used – in 2D (infographics) or 3D… through printers. Where 2D data visualisations are concerned, a lot of emphasis is placed on their aesthetic quality, and how the meaning of the data is structured.. And behind this process lies decisions about what to include and what to exclude, and limitations on what can be shown due to software used…. This there are many contingencies framing the way we understand big data in knowing capitalism! Here I continue my summary of Mayer-Schonberger and Cuker (2017) Big Data: The Essential Guide to Work, Life and Learning in the Age of Insight’. Firstly, simply because so much data is collected on individuals – not only via state surveillance but also via Amazon, Google, Facebook and Twitter,it means that protecting privacy is more difficult -especially when so much of that data is sold on to be analysed for other purposes. Secondly, there is the possibility of penalties based on propensities – the possibility of punishing people even before they have done anything wrong.. Finally, we have the possibility of a dictatorship of data – whereby information becomes an instrument of the powerful and a tool of repression. The value of big data lies in its reuse, quite possibly in ways that are have not been imagined at the time of collecting it. In terms of personal information, if we are to re-purpose people’s personal data than they cannot give informed consent in any meaningful sense of the phrase – because in order to so you need to know what data a company is collecting and what use they are going to put it to. The only way big data can work is for companies to ask customers to agree to have their data collected ‘for any purpose’, which undermines the concept of informed consent. There are still possible ways to protect privacy – for example opting out and anonymisation. Anonymisation is where all personal identifiers are stripped from data – such as national insurance number, date of birth and so on, but here people can still be identified – when AOL released its data set of 20 million search queries from over 650K users in 2006, researchers were able to pick individual people out – simply by looking at the content of searches they could deduce that someone was single, female, lived in a certain areas, purchased certain things – then it’s just a matter of cross referencing to find the particular individual. In 2006 Netflix released over 100 million rental records of half a million users – again anonymised, and again researchers managed to identify one specific Lesbian living in a conversative area by comparing the dates of movies rented with her entries onto the IMD. Big data, it appears, aids de-anonymisation because we collect more data and we combine more data. Of course it’s not just private companies collecting data… it’s the government too, The U.S. collects an enormous amount of data – amounts that are unthinkably large – and today it is possible to tell a lot about people by looking at how they are connected to others. Parole boards in more than half the states of the US use big data predictions to inform their parole decisions. A growing number of precincts use ‘Predictive Policing’ – using big data analysis to select which streets to parole and which individuals to harass..
A research project called FAST – Future Attribute Screening Technology – tries to identify potential terrorists by monitoring people’s vital signs. Cukier now outlines the argument for big-data profiling – mainly pointing out that we’ve taken steps to prevent future risks for years (e.g. seat-belts) and we’ve profiled for years with small data (insurance!) – the argument for big data profiling is that it allows us to be more granular than previously – we can make our profiling more individualised – thus there’s no reason to stop every Arab man under 30 with a one way ticket from boarding a plane, but if that man has done a-e also, then there is a reason. 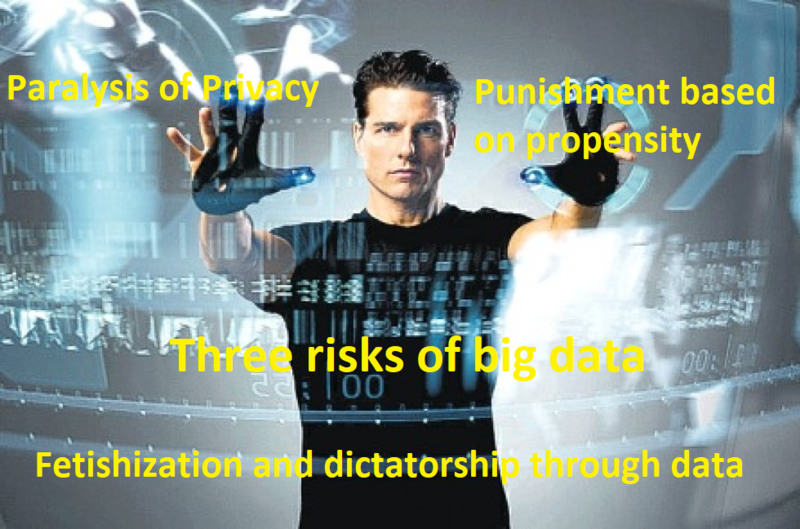 However, there is a fundamental problem of punishing people based on big data – that is, it undermines the very foundations of justice – that of individual choice and responsibility – by disallowing people choice – big data predictions about parole re offending are accurate 75% of the time – which means that if we use the profiling 100% of the time we are wrongly punishing 1 in 4 people. The problem with relying on data to inform policy decisions is that the underlying quality of data can be poor – it can be biased, mis-analysed or used misleadingly. It can also fail to capture what is actually supposed to measure! Education is a good example of a sector which is governed by endless testing – which only measure a slither of intelligence – the ability to demonstrate knowledge (predetermined by a curriculum) and show analytical and evaluative skills as an individual, in written form, all under timed conditions. Google, believe it or not, is an example of a company that in the past has been paralysed by data – in 2009 its top designer, Douglas Bowman, resigned because he had to prove whether a border should be 3,4, or 5 pixels wide, using data to back up his view. He argued that such a dictatorship by data stifled any sense of creativity. The problem with the above, in Steve Jobs’ words: it isn’t the consumers’ job to know what they want’. In his book Seeing Like a State, the anthropologist James Scott documents the way in which governments make people’s lives a misery by fetishizing quantitative data:they use maps to reorganise communities rather than asking people on the ground for example. The problem we face in the future is how to harness the utility of big data without becoming overly relying on its predictions. The first problem is that it will be more difficult for us to forget and escape our past…. While we as individuals grow, evolve and change, comprehensive educational data collected through the years remains unchanged – there is a problem that as the amount of data collected on us through our formative years, we might be judged in the future by this historic data – creating a kind of ‘permanence of the past’. Our historic data record might show a future employer that we were enrolled in a remedial math class in our first year of university, and this fact alone might put them off calling us for interview, even if our maths has evolved in the intervening years, which means we might get credit for how we have evolved in our later years. The problem with data is that it is unlikely to tell anyone about the context in which it takes place – if test scores are low during particular years, for example, the data alone is unlikely to tell us what was going on more broadly in our lives at that time – unlike today, when we can effectively forget low-periods in our lives, in the forthcoming age of big data, they will always be on display for anyone to scrutinise, without access to the more in-depth context. Employers already track Facebook posts, if there is more educational data, then they might well delve into that too. Today schools make predictions based on ‘small data’, yet students can argue against the paths suggested by such small data (GCSEs etc) because it is precisely that, small, collected at only a few points in time, clearly not telling the whole story. In the Big data age, however, predictions based on more data may become so accurate that they lock students into educational tiers of particular programmes of study – some universities are already experimenting with ‘e-advisors’ – since the University of Arizona implemented such a system in 2007, the proportion of students moving on from one year to the next has increased from 77% to 84%…. In future these systems may evolve to advise, or prevent, students from undertaking particular courses of study deemed to be too difficult for them. This may lock-in students to pre-determined study and career paths, which may have a detrimental effect on equality of opportunity. A third problem, largely dismissed by Cukier, is that the fusion between big data and educational institutions will only work if students and parents consent to tech companies having access to their children’s private data. For some reason he cannot see the problems with this, which suggests more than anything else he’s an industry-insider. How will Big Data Change Social Research? Big data will change the nature of social research – more data will do away with the need for sampling (and eradicated the biases that emerge with sampling); big data analysis will be messier, but this will lead to more insights and allow for greater depth of analysis; and finally it will move us away from a limiting hypothesis-led search for causality, to non-causal analysis based on correlation. At least according to Mayer-Schonberger and Cuker (2017) Big Data: The Essential Guide to Work, Life and Learning in the Age of Insight. It does away with the need for sampling, and all the problems that can emerge with biased sampling. More data enables us to make accurate predictions down to smaller levels – as with the case of Google’s flu predictions being able to predict the spread of flu on a city by city basis across the USA. It enables us to use outliers to spot interesting trends – for example credit card companies can use it to detect fraud if too many transactions for a particular type of card originate in one particular area. Cukier uses Steven Levitt’s analysis of all the data from 11 years worth of Sumo bouts as a good example of the interesting insights to be gained through big data analysis. A suitable analogy for big data may be the Lytro camera, which captures not just a single plane of light, as with conventional cameras, but rays from the entire light field… the photographer decides later on which element of light to focus on in the digital file…. And he can reuse the same information in different ways. One of the areas that is most dramatically being shaken up by big data is the social sciences, which have traditionally made use of sampling techniques. This monopoly is likely to be broken by big data firms and the old biases associated with sampling should disappear. Albert-Laszlo Barabasi examined social networks using logs of mobile phones from about one fifth of an unidentified European country’s population – which was the first analysis done on networks at the societal level using a dataset in the spirit of n = all. They found something unusual – if one removes people with lots of close links in the local area the societal network remains intact, but if one removes people with links outside their community, the social network degrades. All other things being equal, big data is ‘messier’ than small data – because the more data you collect, the higher the chance that some of it will be inaccurate. However, the aggregate of all the data should provide more breadth and frequency of data than smaller data sets. Cukier uses the analogy of measuring temperature in a vineyard to illustrate this – if we have just one temperature gauge, we have to make sure it is working perfectly, but it we have a thousand, we will have more errors, but a much wider breadth of data, and if we take measurements with greater frequency, we will have a more sensitive measurement of changes over time. When using big data, analysts are generally happy sacrificing some accuracy for knowing the general trend – in the big data world, it is OK if 2+2 = 3.9. More data is sometimes all we need for 100% accuracy, for example chess games with fewer than 6 pieces on the board have all been mapped out in their entirety, thus a human will never be able to beat a computer again once this point has been reached. The fact that messiness doesn’t matter that much is evidenced in Google’s success with its translation software – Google employed a relatively simply algorithm but fed it trillions of words from across the internet – all of the messy data it could find – this proves that simple models and lot of data trump smart models and less data. We see messiness in action all over the internet – it lies in ‘tagging’ and likes being rounded up – none of this is precise, but it works, it provides us with usable information. Ultimately big data means we are going to have to become happier with uncertainty. It might be hard to fathom today, but when Amazon started up it actually employed book critics and editors to write reviews of books and make recommendations to customers. Then the CEO Jeff Bezos had the idea of making specific recommendations to customers based on their individual shopping preferences and employed someone called Greg Linden to develop a recommendation system – in 19898 he and his colleagues applied for a patent on ‘item to item’ collaborative filtering – which allowed Amazon to look for relationships between products. As a result, Amazon’s sales shot up, they sacked the human advisors, and today about 1/3rd of all its sales are based on their recommendations systems. Amazon was an early adopter of big data analytics to drive up sales, and today many other companies such as Netflix also use it as one of the primary methods to keep profits rolling in. These companies don’t need to know why consumers like the products that they do, knowing that there’s a relationship between the products people like is enough to drive up sales. In the big data world, correlations really shine – we can use them to gain more insights extremely rapidly. At its core, a correlation quantifies the statistical relationship between two data values. A strong correlation means that when one of the data values changes, the other is highly likely to change as well. Correlations let us analyse a phenomenon not by shedding light on its inner workings, but by identifying a useful proxy for it. In the small data age, researchers needed to use hypotheses to select one or a handful of proxies to analyse, and hence hard statistical evidence on the relationship between variables was collected quite slowly; with the increase in computational power we don’t need hypothesis-driven analysis, we can simply analyse billions of data points and ‘stumble upon’ correlations. In the big-data age we can use a data-driven approach to collecting data, and our results should be less biased and more accurate, and we should also be able to get them faster. One such example of where this data-driven approach has been applied and strong big data correlations was the case of Google’s flu predictions. We didn’t need to know what flu search terms were the best proxy for ‘people with flu symptoms’, in this case, the data simply showed us which search terms were the best proxies. We can use correlations to predict the future – for example, Wal-Mart noticed a correlation between Hurricanes and Flash Light sales, but also pop tarts, so when a Hurricane is predicted, it moves the pop tarts to the front of store and further boosts its sales. Probably the most notorious use of big data correlations to make predictions is the American discount retailer, Target, who use their data on the products women buy as a proxy for pregnancy – women tend to buy non scented body lotions around the third month of pregnancy and then various vitamin supplements around the 6 month mark – big data even allows predictions about the approximate birth date to be made! Finding proxies in social contexts is only one way that big-data techniques are being employed – another use is through ‘predictive analytics’, which aims to forsee events before they happen. One example of predictive analytics is the shipping company UPS using them to monitor its fleet of 10s of 1000s of vehicles – to replace parts just before they wear out, saving them millions of dollars. Another use is in health care – one piece of research by Dr Carolyn McGregor, with IBM,, used 16 different data streams to track the stats of premature babies – and found that there was a correlation between certain stats and an infection occurring 24 hours later. Interestingly this research found that an infant’s stability was a predictor of a forthcoming infection, which flew in the face of convention – again we don’t know why this is, but the correlation was there. Big data also makes it easier to find more complex, non-linear relationships than when working within a hypothesis-limiting small data paradigm. Big data also opens up more possibilities for exploring networks – by analyzing how ideas spread through the nodes of networks such as Facebook, for example. In network analysis, it is very difficult to attribute causality, because everything is connected to everything else, and big data analysis is typically non-causal, just looking for correlations not ‘causation’. Does big data mean the end of theory? In 2008 Wired magazine’s chief editor argued that in the ‘Petabyte age’ we would be able to do away with theory – that correlation would be enough for us to understand reality – citing as examples Google’s search engine and gene sequencing – where simply huge amounts of data and applied mathematics replace every other tool that might be brought to bear. However, this view is problematic because big data is itself founded on theory – it employs mathematical and statistical theories for example, and humans still select data, or at least the tools which select data, which in turn are often driven by convenience and economic concerns. Having said that, Big Data does potentially move us away from theory and closer to empiricism than in the small data age. How will Big Data Change Education? Big Data will make Feedback more focussed on effective teaching rather than student progress, it will make learning more individualised, and it will enable us to make probabilistic predictions about what programmes are best for different students. This post is a summary of the section at the back of this book, which focuses on big data and education (introduction to this section is here). An excellent counter point to the outrageous, almost entirely speculative and sweepingly general claims made in this book is Neil Selwyn’s ‘Is Technology Good for Education?‘ – the later is based on stacks of peer-reviewed evidence, the former on speculation only. How will big data change feedback in education? In the small data age, data collection in schools was largely limited to test scores and attendance, focussing on collecting standardised data on student performance, with feedback being almost exclusively in one direction – from the teachers to the schools to the kids and their parents – what is not measured is how well we teach our kids, or how effective different teaching techniques are in facilitating student progress. Big data changes this by datafying the learning process – for example, e-books allow us to track how students read books, what they take notes one, at what point the give up reading, what sections they go back and check – thus we can measure how effective different books are, or different passages within books are, at helping students to understand knowledge, which can be used as a basis for immediate and differentiated intervention by teachers. We could also use e-books in conjunction with testing to measure the relationship between different textual materials and the ‘decay curve’ – the rate at which students forget knowledge, which might be useful in improving test scores. Companies such as Pearsons and Kaplan are very involved in producing e-books, but at time of writing (2017) even in America only 5% of school text books are digital. In schools, the education which we are exposed to is standardised into a one size fits all package, tailored to a mythical average student. Learning has barely evolved from the industrial era – the materials students are given are identical, and the learning process still works essentially like an assembly line, with all students being paced through a syllabus at the same rate and learning benchmarked against a series of standardised tests. All of this is tailored towards the needs of the teachers and the system, not the needs of the students. However, in the Big Data age, following the American economist Tyler Cowen, ‘average is over’, and following Khan Academy founder Sal Khan ‘one size fits few’. The problem with the current, industrial era education system is that very few people actually benefit from it – the bright student is bored, while the weaker understands nothing. What we need is a means of flexibly adapting the pace and content of teaching to better fit the needs of individual students. Tailoring education to each student has long been the aim of adaptive-learning software – an example of this is Carnegie Learning’s ‘Cognitive Tutor’ for school mathematics which decides which math questions to ask based on how students answered previous questions. This way it can identify problem areas and drill them, rather than try to cover everything but miss holes in their knowledge, as happens with the traditional system. Another example is New York City’s ‘School of One’, a math programme in which students get their own personalised ‘playlist’ determined by an algorithm, each day, with maths problems for them suited to their needs. Such individualised learning systems are dynamic — the learning materials change and adapt as more data is collected, analysed and transformed into feedback. More advanced material is only provided once students have mastered the fundamentals. All of this is based on the idea of the ‘student as consumer/ client’ – one argument is that ‘if we can rip our favourite music and burn it into our own playlist’, why can’t we do this with education? A second argument is that in any other field of business, consumers provide feedback on products and the manufacturers improve (and increasingly personalise) the products to meet the demands of diverse consumers…. Adaptive learning should transform education into something which is more responsive to the needs of students/ consumers, rather than it being led by unresponsive systems and teachers. In a trial of 400 high school freshmen in Oklahoma, the Cognitive Tutor system helped them achieve the same level of math proficiency in 12% less time than students learning math in the traditional way. According to Bill Gates, talking in 2013, students on remedial education courses using adaptive software outperformed students in conventional courses and colleges benefitted from a 28% reduction in the cost per student. For example, we may spot that teaching materials of a certain sort will improve a particular person’s tests scores by 95%, but if we make a recommendation based on this, it will not work in 5% of cases. This is something we are going to have to learn to live with, and parents and students are going to have to bear the risk – for example, all Big Data can do is to tell ‘clients’ that if they study this particular course, then there is a 70-80% chance they’ll see ‘x’ amount of improvement. However, some probabilities will be more certain than others, and so for at least some specific recommendations, we can act with reasonable certainty. Personally, as a teacher myself I’m sceptical when non-experts start making sweeping predictions about the future of education based on speculation, especially when one of the claims for the Big Data is that it provides empirical insights, such speculation is hypocritical, precisely because it’s not based on any actual data! The idea that transnational technology companies are going to help everyone in education is nonsense – they are profit driven, the fact that profit comes first, and that this will be a limiting factor in how data is used in the future is not even mentioned. They see ‘teachers as the enemy’ – as a barrier to Big data, this is highly dismissive of a group of people who have gone into a job to benefit children, where I doubt that people for tech companies do not have this as their primary motive – also see below, for an alternative explanation of their criticism to ‘teachers as a barrier’ to ed tech companies playing more of a role in education. The ‘one size fits all model’ might be dominant in education because with a teacher student ration of 1-100 (in colleges) teachers literally cannot meet the individual needs of individual students. There simply isn’t time for this, along with the need for teachers to keep on top of the knowledge themselves, and keep up to date with technological changes, institutional-legal requirements, and do all of the (still necessary) marking of students work. Related to the above point, making teachers analogous to other professionals with clients, I don’t believe there’s any other field of work where professionals are expected to deal with 100 clients at a time and personally interact with each of them every single day in a meaningful way… dealing with diverse and complex knowledge (rather than specialising in one particular thing, i.e. a haircut, or a financial advice for example) – while it might be fair to expect teachers to respond to ‘clients’ demands, 1 teacher cannot do this with 100 students. The ratio needs altering (1-10 maybe?). The authors cit very few examples of peer-reviewed evidence to back up their claims. Will Big Data Change Education? How will big data analytics reshape how we teach and how we learn; and how will it change what we learn? This is one of the questions posed in ‘Big Data: A Revolution That Will Transform How We Live, Work and Think’ (2013) by Viktor Mayer-Schonberger Kenneth Cukier. You might like to read this post first: What is Big Data? How big data will change the process of education? First – we know more about individual differences because we can track student performance better – continuously through the learning process – educational data moves from stock to flow. Second – we can tailor lessons to the needs of the individual, not the general average, which is actually no one! Third – we can more easily learn what works best in teaching, the data enables a feedback loop. In short, the education system can be redesigned around handling individual differences, rather than trying to eradicate them or treat them as if they don’t exist. How big data will change what we learn in education? As to the question of what we learn – the increased role of big data in society means we will need to become more comfortable dealing with probabilities rather than certainties… and we will need to learn that we know far less than we think! Big data means that many jobs – many of those involving making decisions – will be automated in the future, but humans have unique capabilities such as creativity and originality, irrationality and the ability to break radically from the past – so education should foster these things rather than seeing education as a process of pouring knowledge into the skulls of students. Conventional education may have difficulty of breaking out the old mold of education, and digital disrupters are playing an insurgent role….